Thousands of supporters of deposed president Mohamed Morsi have taken to the streets across Egypt on Friday in protest of his upcoming trial which is due to begin Monday. In the greater Cairo area, marches have begun following Friday prayers in several districts including Gesr El-Suez, Ain Shams, Nasr City, Shobra, Haram, Mattariya, Mohandiseen, Helwan, and El-Warraq. 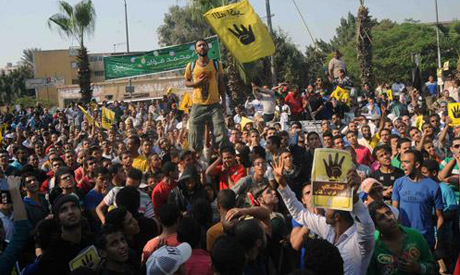 In Cairo, a march also reached the vicinity of Al-Ittihadeya presidential palace in Heliopolis district. However, the army had barricaded the one-time-headquarters of deposed president Morsi with tanks and barbed wire to prevent protesters from reaching it. A similar march reached Al-Qobba Palace, another presidential house located in Hadayek El-Qobba. Another pro-Morsi march converged at the Military Intelligence headquarters on Salah Salem road in Cairo, state news agency MENA reported. In Mattariya, police intervened to break-up clashes between protesters and anti-Morsi locals. In Nasr City, locals skirmished with protesters who were chanting against the leadership of the army. In Alexandria, Egypt's second largest city, thousands are marching in neighbourhoods such as eastern Alexandria's Sidi Beshr and Borg El-Arab, a working-class suburb west of the city. In Sidi Beshr, police fired tear gas to end clashes between pro-Morsi protesters and local opponents. Security forces also arrested tens of pro-Morsi protesters. In Suez, protesters and police clashed. As pro-Morsi demonstrators threw rocks, police fired teargas to disperse the crowds, reported Al-Ahram's Arabic website. Police forces occupied the main squares to prevent attempts to start a sit-in. Friday's street protests come on the heels of days of intense clashes between Morsi's supporters and opponents on university campuses nationwide. On Wednesday, police stormed Al-Azhar University campus in Cairo to disperse a student protest against the country's interim government. Protests are also reported on Friday in Upper Egypt's Assiut, Minya, Fayoum, Beni Suef, and in the Nile Delta governorates of Gharbiya, Mahalla, Damietta and Beheira. North Sinai and Suez city have also witnessed pro-Morsi marches. Protesters turnout on Friday has seen a significant increase from previous weeks. The National Alliance to Support Legitimacy, an Islamist coalition backing Morsi, has vowed to stage daily protests starting on Friday, to culminate with mass mobilisation efforts on Monday when Morsi goes to court. The ousted president faces several charges, including incitement of murder and violence in the December 2012 presidential palace clashes. The detained leader has refused to recognise the legitimacy of the the court trying him. Morsi was ousted on 3 July amid mass nationwide protests against his rule. Since then, Morsi's supporters, namely the Muslim Brotherhood group from which he hails, have staged regular protests calling for his reinstatement. Egypt is now a democratic country, so why cant muslim brother supporters accept that? The ppl voted Morsi in, and the same ppl took him out. He left egypt without hydro and gas and asked ppl to kill anyone opposing him. Why would anyone still want or defend this man? You need to accept democracy and stop hiding behind your religion and using it as an excuse to kill ppl. There is nothing islamic about murder!!! Accept the 90% of the egyption ppls voice....that say this is the gov they want. Morsi is a criminal and will never come back. Get a life and go pray for forgiveness!!! By force govt have to go. For how long this fake government keep Egyptian in side dark tenel? Muslim brothers use religion to try to gain ppl....but they r not religious in any way and dont do anything islam asks. STOP KILLING INNOCENT PPL IN THE NAME OF ALLAH!!! You ppl make me sick. Let the gov do its job and go pray for forgiveness. It is a trial by the murderer of his victim, by the thief of his victim and by the unelected usurpers of the people's will of the democratically elected President. The depravity of Egypt today transcinds reality. What is hapenning inEgypt today defies linguistic description. Didn't understand what your trying to say? Are you just putting random words together to sound smart?